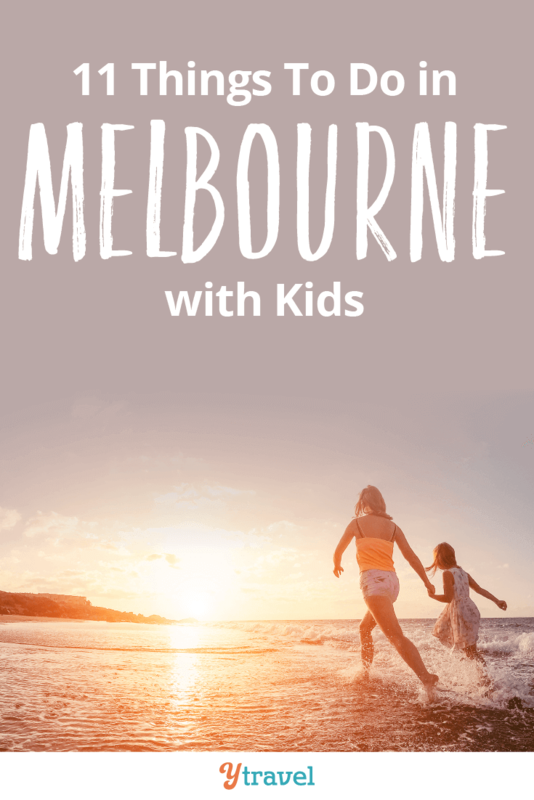 Thinking of visiting Melbourne this year but you’re not quite sure what you’ll do with the kids while you’re there? Never fear, there’s a lot going on all-year-round in Melbourne for kids of all ages, just ask our six-year-old Kalyra. Kalyra became quite attached to Melbourne during the period we spent there. She loves big cities and wants to live there one day, with the only downer being the inconsistent and awful weather. Melbourne is made for cyclists. Whilst you do have to watch the die-hard crazies riding like they are in the velodrome, the numerous biking trails are great for kids. We loved exploring the Yarra River and Bayside foreshore from St Kilda to Brighton on our bikes. 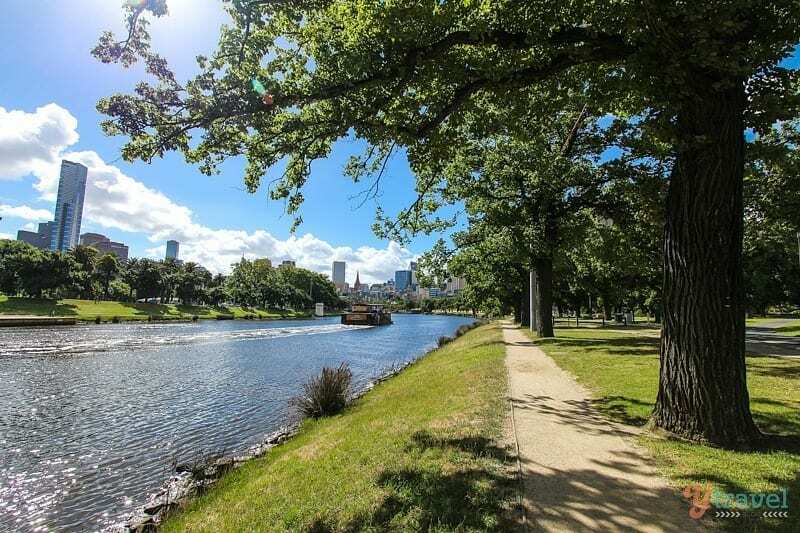 One of our accommodation stays was at South Yarra and every afternoon we used to ride into the city following the Yarra River. I’ll never forget Kalyra bouncing on the seat of her bike as we rode down Swanston St, through the centre of Melbourne. “This is the best fun ever!” she said. I, on the other hand, rode behind her having mini-heart attacks as trams passed her by and pedestrians weaved around us. That particular adventure is not for the faint-hearted! Look out for Art Play. What an amazing concept for kids! Just down from Federation Square along the Yarra River, you’ll find this building dedicated to kids exploring their creative talents. You do have to pay, but they often have free activities. We met up with a friend and our kids created their own universes made out of materials in the garden. We don’t usually visit museums much, but we enjoyed learning more about the history of moving arts and creating weird video clips at the Australian Centre for the Moving Image in Federation Square. Melbourne has a thriving arts and science scene. There are plenty of interactive spaces for your kids to learn and be entertained if this is the sort of thing that gets them excited. My girls are devoted to a good hot chocolate or babycino paired with a muffin or chocolate brownie! And for a real indulgence and an experience you’ll all love, hit up the High Tea at the Langham Hotel on Southbank. The Langham serves a top-shelf high tea with different themes, when we were in town it was a child’s ‘Frozen’ high tea based on the movie. 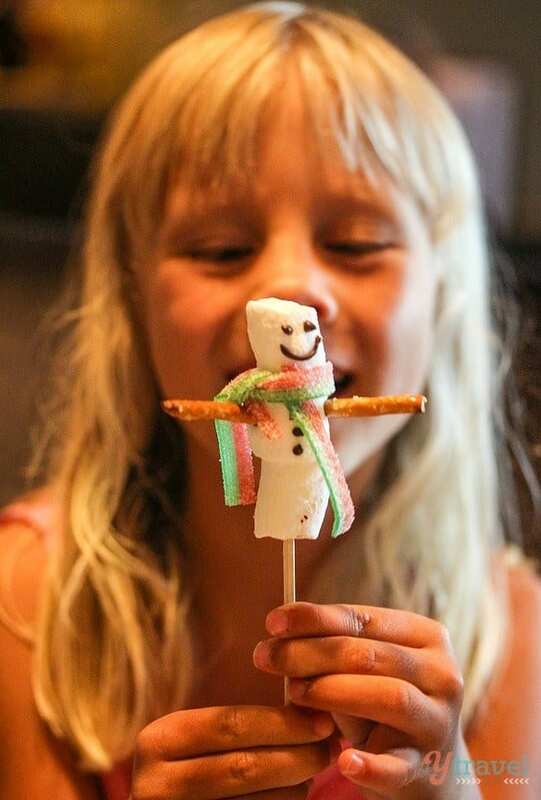 “This is the happiest day of my life,” Kalyra grinned as best as she could as she bit into her marshmallow snowman. And possibly the worst day of yours when the sugar hits! The girls were devastated when we left Melbourne the day the Barbie High Tea was on. (Don’t say anything, but Craig was even more devastated). 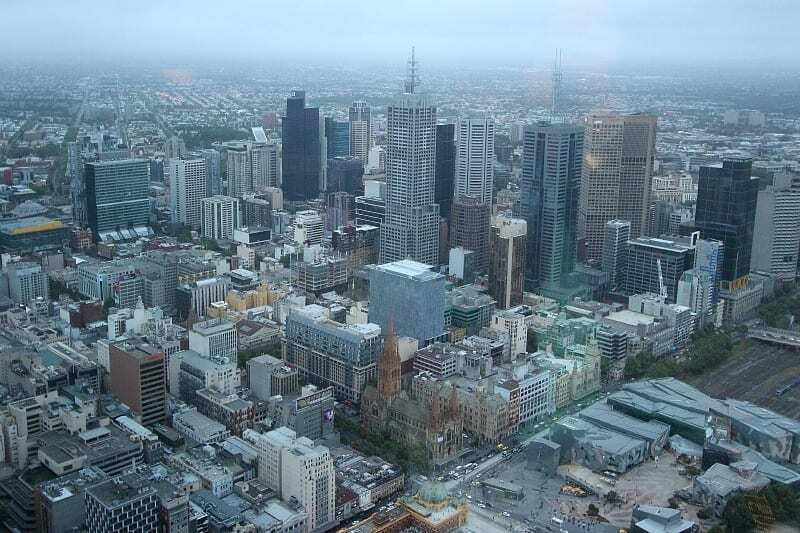 Judging by the number of kids running around the Eureka Skydeck squealing, I’d say the 360 degree views of Melbourne, from the highest viewing platform in the southern hemisphere, is a hit for kids in Melbourne. I recommend going up just on sun down so you experience Melbourne by day and as it slips into night. We didn’t go up on the best day, but if the weather is kind, the sunset views are stunning and you get a top view of the city. And put your thrill pants on while you’re there and stand on the edge of the building. It’s slightly freaky, but well worth it. I had no idea Melbourne had nice beaches – even beautiful beaches. Move a little further away from St Kilda and the city and you’ll discover some amazing family friendly beaches. During the summer the water temperature is decent and calm making it the perfect beach for kids. 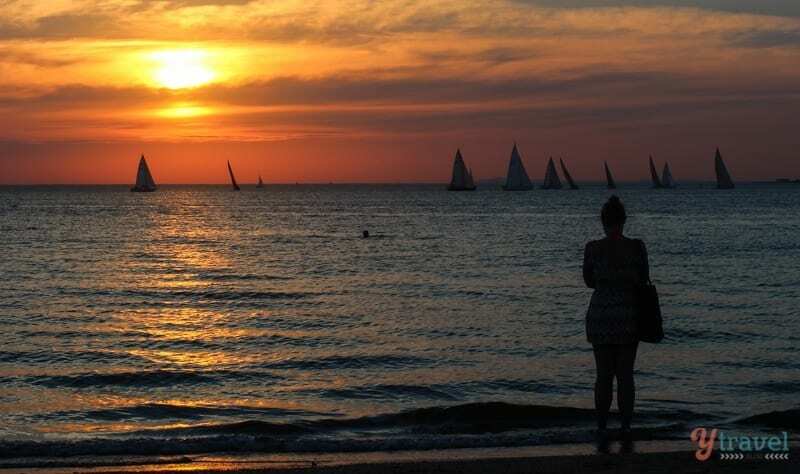 Our favourite are Elwood and Parkdale beaches. 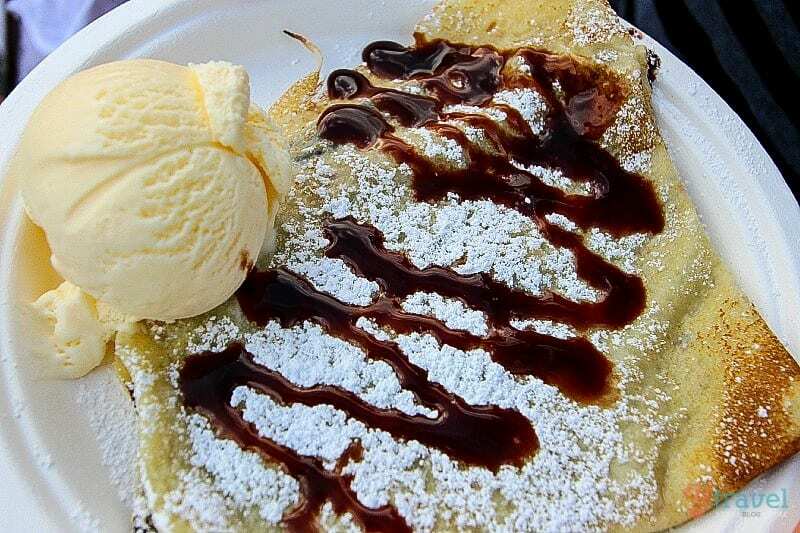 A treat your kids will love is a pizza and ice cream dinner while watching the sunset on St Kilda beach. While they play in the sand, you can relax with a glass of vino. Melbourne’s gardens took me back to my years living in London where, due to the absence of the ocean, we’d head to the leafy parks and gardens on a hot summer’s day for a sunbake and a picnic. Fitzroy Gardens, Carlton Gardens and the Botanical Gardens are my favourites in Melbourne. During the summer months, they often have free music and shows that the kids are sure to love. And the community gardens at St Kilda next to Luna Park run by volunteers is a cool place to visit. 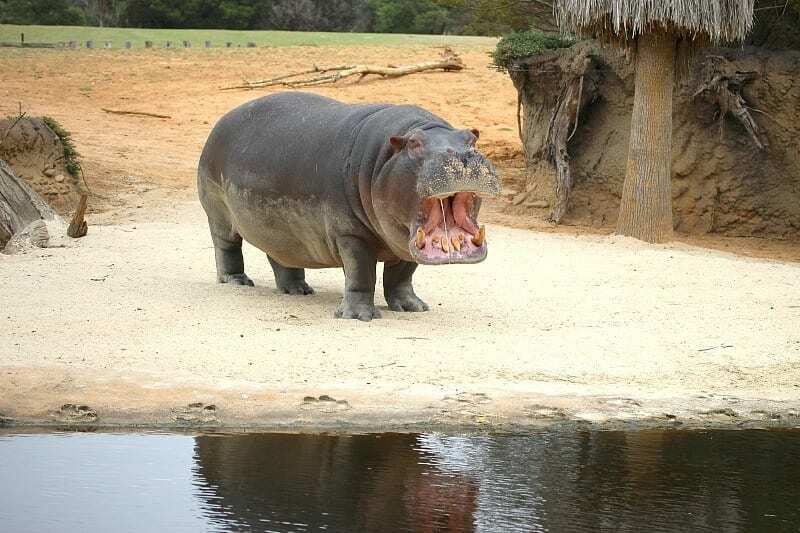 I was not expecting much from Werribee Zoo. I love it when a place surprises you! While it certainly isn’t a patch on a real African safari, it’s probably as good as most kids are going to get without getting on a plane. I loved how close you could get to the animals and the zoo’s strong focus on conservation of endangered animals. Melbourne seems to have a new festival or event on every week. While in Melbourne, the girls enjoyed a day of tennis, games and concerts at the Australian Open kids’ day, the Saturday before the Aussie Open began. We were also in the city when the Moomba festival was on by the Yarra River and there were plenty of things for the kids to do there. Savannah still looks at the picture of the Fun House on my phone, and asks if she can sit on my lap again and go down the slide together. We were also there during the Spring Horse Racing Carnival. The Saturday after the Melbourne Cup is family day (Steaks Day) and they have a great section set up to keep the kids entertained. Although next time mummy and daddy are bringing in the babysitters! 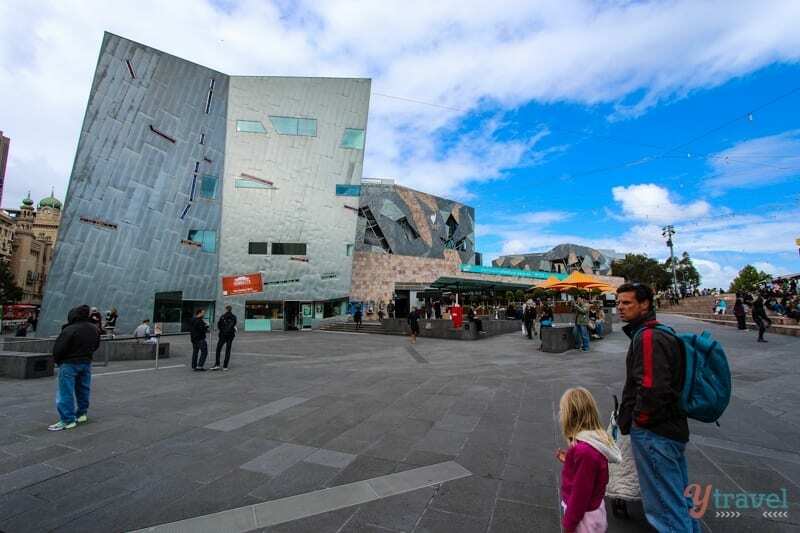 Federation Square occupies a whole urban block right on the banks of the Yarra River and sits directly opposite Flinders Street Train Station and St Paul’s Cathedral. 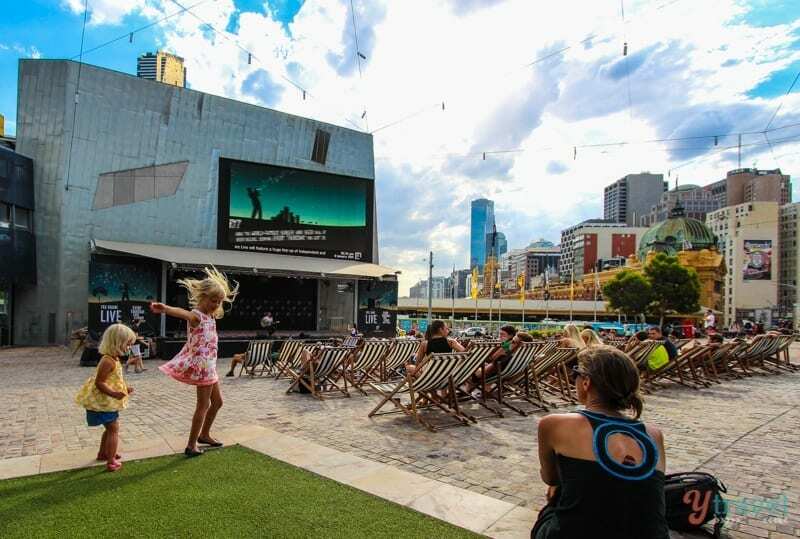 It’s a great family friendly environment at Fed Square with lots of cool stuff going on: you get free Wi-Fi, free daily health and wellness classes, museums and galleries, rooftop honey bees and gardens, restaurants and bars that have deals, and free sports on the BIG TV screen. . 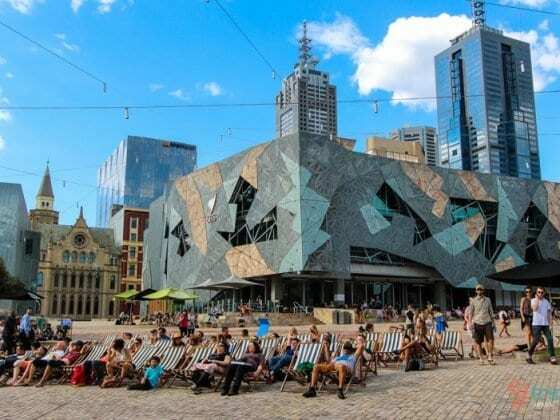 But our fave was the Fed Square Live which celebrates Melbourne’s top acoustic acts in a series of free outdoor concerts on Thursdays through the summer. Oh, and it comes complete with free beach chairs spread out in front of the stage and room for the kids to jump around. Who doesn’t love a good open air market? Your kids will love shopping at the Queen Vic Markets which has something for everyone. But the highlight for us was the Wednesday Night Market which serves up a global street food extravaganza with offerings from all over the world. It was like any night food market you’d find in Asia, buzzing with atmosphere and cheap (for Melbourne) street food. The kids tucked into a crepe, Caz had a goat curry and I demolished a kangaroo burger. 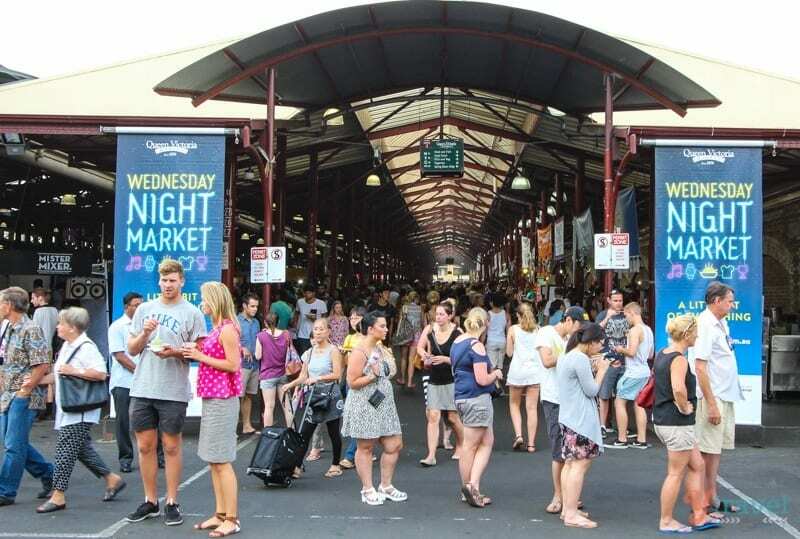 The night market runs every Wednesday from November – March and is an awesome thing to do in Melbourne with kids. Booking.com has 600 hotels, apartments, and hostels in Melbourne. You get free cancellation on most rooms, and a best price guarantee! 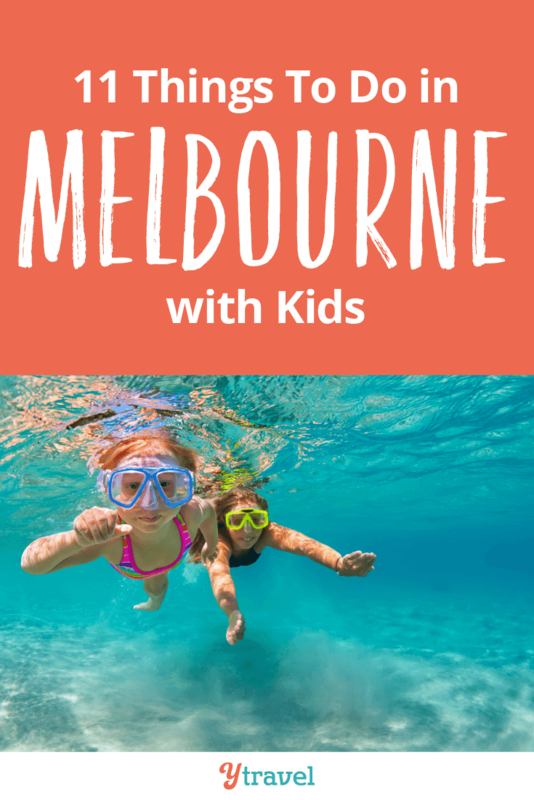 Can you add to our list of things to do in Melbourne with kids? Please share any tips in the comments. Melbourne is a heaven for my kids. we often visit it during our vacation time. Love you Melbourne. You’re so right! 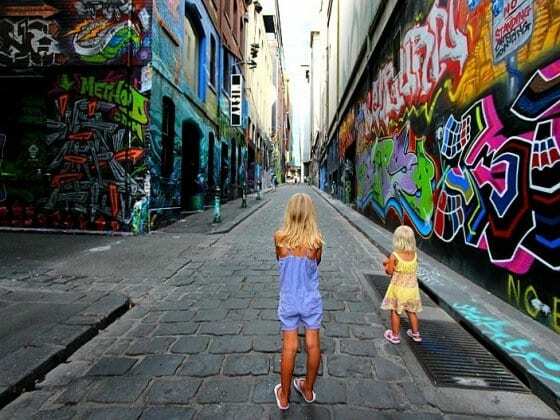 Melbourne is a perfect city for kids. Even though I am not a kid, I enjoyed there like a kid! I mean there is a carefree air – there is a certain something that’s very, very easy-going, yet magical. Love Melbourne! It seems very liveable as well Renuka. Definitely has that good vibe! Add a brilliant little surprise for kids by going to St Kilda pier to see Little Penguins on the breakwater. There is a public viewing area. But, people need to read the information from this page ( http://stkildapenguins.com.au/skp/ ) about how to be responsible when viewing the gorgeous little creatures. Melbourne does offer a lot for families, every city has it’s charms that need to be uncovered. Great article, you all obviously had such a fun time down here. We missed the penguins in St Kilda Jane. Thanks for the link of information. Haha this post was by far my fave. Mainly because I got to experience much of this journey with you. I too remember the fun house and sliding down with little K, the bike rides and beach walks. Great post!! I just love Melbourne, and miss it often now that I live abroad. Next time you go, try and visit the aquarium – it’s a great place for kids as well. And if you’re up for a day trip out of the City, try Healsville sanctuary. I LOVED Melbourne when I lived there (again, except for that ridiculous weather! ), so I’m not surprised your girls loved it. They obviously have very good taste! Great post! I also like Melbourne, It is an awesome place to enjoy. It seems that your kids had a lots of fun in Melbourne. I would like to suggest you another place. I went to Brighton which is located in Melbourne. There is a restaurant named The Middle Brighton Baths. I enjoyed too much over there. it is an amazing place to take dinner, breakfast etc. Kids can make lot of fun over there. People can enjoy amazing sea views while taking dinner. This restaurant is really a very nice place. You’re really good, writing everything you had at Melbourne to this site. I know your kids really had fun, but I guess you had too! The images you posted are convincing. 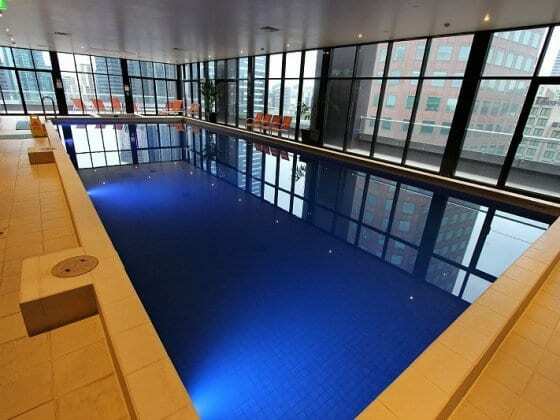 Everyone would love to experience what you had experienced in Melbourne. Great! Thanks for all the useful tips! 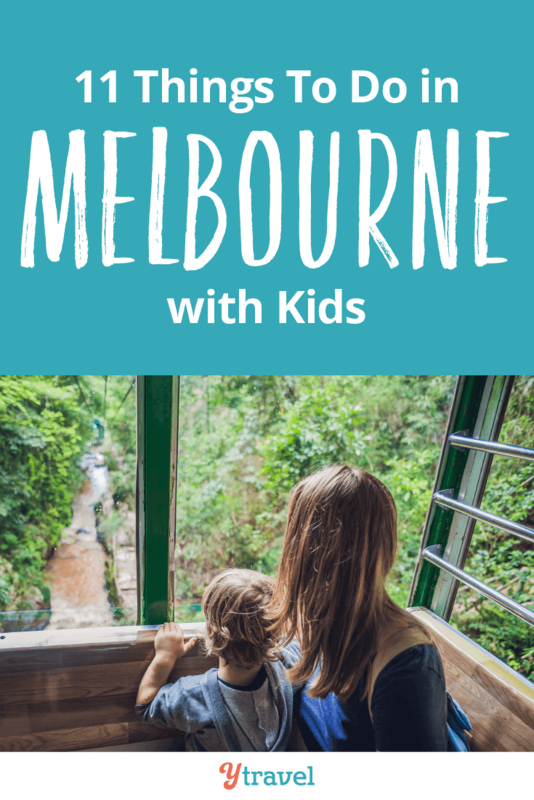 We are headed to Melbourne with two kiddos in April and I will definitely be using some of these ideas. Another great read thanks to you Craig! I am always amazed at how you are able to write and make your readers feel that they are just talking to a friend. My favorite part is Sporting events and festivals. Keep writing please!